Books, Fairy doors, and other creative works. 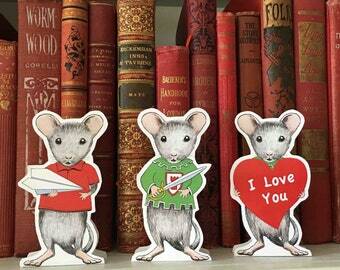 Announcement Books, collectible hand painted miniature doors, story cards, architectural art and hand crafted items. Handmade in USA with a touch of magic. We're inspired by an antique Paris Cabinet built in the 1880s. For years we have been caretakers to this intriguing magical piece of Paris. We are husband and wife and everything is made, painted and shipped by the two of us from our studio. "Buyer will not be disappointed with this seller who offers excellent customer service. The little door is a wonderful piece of art to hide for little ones to discover the wonderful world of magic!" Please visit Karen Leigh Studio blog for her story of her incredible fairy stairs. Books, collectible hand painted miniature doors, story cards, architectural art and hand crafted items. Handmade in USA with a touch of magic. This mouse is so cute. I tucked him away, and will display him next year with my Valentine decorations. Thanks. 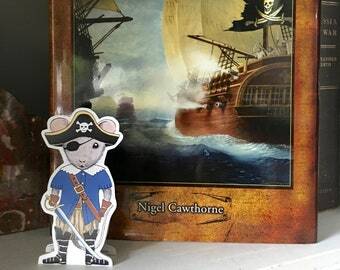 The pirate mouse is my favorite of the 4 mice I purchased. Thank you! Super cute. Reminds me of when my sons were little, and they liked to practice swashbuckling with any old stick they found in the woods! Thank you. We are inspired by an antique Paris Cabinet built in the 1880s. Welcome to our shop! We are husband and wife, both self employed. The Paris Cabinet is our inspiration, it's in the room where we entertain, where the mirror reflects candle light, where we can have beer if the evening is a pub night, wine with a meal or fabulous Ficklin port with friends and neighbors. Jan, pronounced yan, is a Dutchman, born and raised in the Netherlands (Holland) and is an architectural illustrator and artist. I’m Donna, an American mutt of mixed heritage, Mexican, English, American Indian, Spanish and supposedly a dash of French, that's what I call an American mutt! I love designing in silver, copper, paper, fabric and also wood. Jan grew up playing in his father's woodworking factory and now loves the sounds of woodworking tools as he builds woodworking projects. God blessed us when he brought together two people who enjoy the same things and even crave the same food. We've lived in Los Angeles and Holland for several years, a great experience for me as an American. Living in Europe I learned to appreciate the old world, Dutch heritage and love of anything "gezellig." That word itself is part of the Dutch culture. Now, in California we combine our experiences of Europe, the medieval town where we lived, Amersfoort, visits to Amsterdam, Paris, London, Brugge, Praque and other cities. Jan, pronounced yan, is a Dutchman, architectural illustrator and artist, I’m Donna, an American mutt of mixed heritage and love designing in paper and fabric and using vintage sewing machines. Thank you for visiting our shop, Paris Cabinet. We carefully create things with a little magic infusion to please our customers. If you are not happy with an item return within 14 days, use tracking. Refunds for the item, minus the shipping. Please read all item descriptions and view all photos. No refunds for things that could easily be copied, books, prints, art, etc. We will pack your item carefully to avoid damage. Pay direct with credit or debit card to Etsy or by Paypal. Paypal also has an eCheck method but that will take a few days to clear. Residents of California will be charged sales tax. It will calculate when you make your purchase. No sales tax is charged if you live outside of California. We ship as quickly as we can, many times same day, other times could be a day or two depending on our schedule and if item is in stock. Shipments are USPS with tracking. If you want insurance please send a conversation message so we can calculate the additional fee. International shipments may be charged a customs fee, it is the responsibility of the buyer to pay any fees in their country. We will gladly work with you for custom orders, just send an Etsy conversation message and tell us your desires and where your order will be shipped to give you a quote.